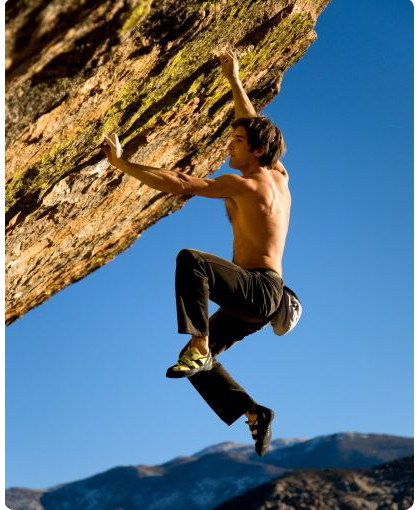 The world of rock climbing is defined by the people who push the limits of defying gravity. There have always been great climbers; however, every generation seems to produce one climber who blows away all previous standards and redefines what is possible. 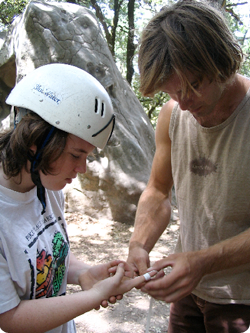 Since 1994, when he was only 13 years old, Chris Sharma has been considered the world's greatest free climber, repeatedly breaking the barriers of human climbing potential. For over 15 years the world's top climbers have measured the technical difficulty of their own ascents by the routes and boulder problems Chris has established. Chris' cutting-edge first ascents span the globe: he has established the most difficult routes in Europe, Asia, Australia, and South America, and of course in his home state of California in the United States. Although he does not consider himself a competition climber, Chris has won numerous international climbing competitions, including invitational World Cup events and the highly publicized ESPN X-Games. Recently he has been focusing his attention on establishing many routes in the 5.15 grade of difficulty for sport climbing, a level very few other climbers have touched. Despite his achievements and fame, Chris is equally known for his humility and light-heartedness, characteristics that have made him many friends and fans throughout the world. Though he regularly performs at an extremely demanding physical level, Chris has also focused a great deal of his attention on cultivating his spirituality. In November of 2001, he completed a 720-mile walking pilgrimage in Japan that brought him to 88 Buddhist temples. One of Chris' favorite Buddhist proverbs is, "All the suffering in the world comes from wishing one's own self to be happy; whereas all the happiness in the world comes from wishing others to be happy." For Chris, this was the thrust behind the Sharmafund.